American Airlines is the largest airline in the world in terms of total passengers transported, and the second-largest airline in the world (behind Air France-KLM) in terms of total operating revenues. A subsidiary of the AMR Corporation, the airline is headquartered in Fort Worth, Texas, adjacent to the Dallas/Fort Worth International Airport. 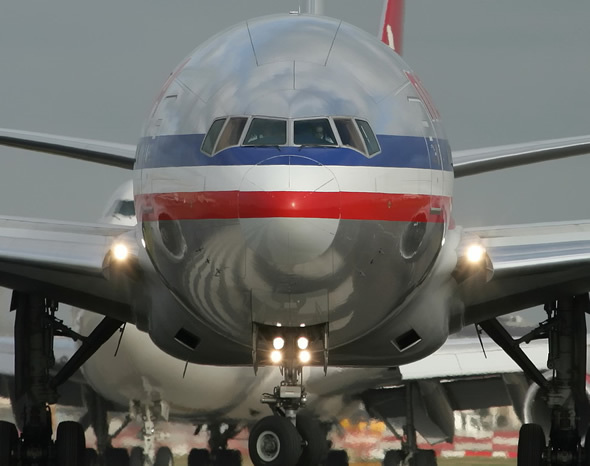 American operates scheduled flights throughout the United States, as well as flights to Canada, Latin America, the Caribbean, Western Europe, Japan and India. The chairman and CEO of AA is Gerard Arpey. By many measures, including passenger traffic, fleet size, and number of employees, American is the world's largest airline. As of February 2006, AMR Corporation served 171 cities with a fleet of 993 aircraft handling 80 million passengers a year with an average of 2,600 daily departures. American carries more passengers between the US and Latin America (12.1 million in 2004) than any other airline, and is also strong in the transcontinental market. 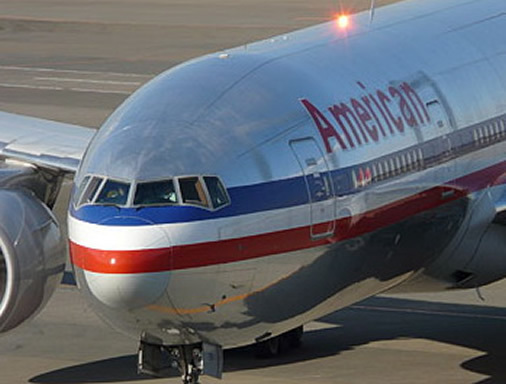 American has seven hubs: Dallas/Fort Worth, Chicago O'Hare, Miami, St. Louis, Boston, LaGuardia, and New York JFK. Dallas/Fort Worth is the airline's largest hub, with AA operating over 84 percent of flights at the airport and traveling to more destinations than from any of its other hubs. Los Angeles International Airport and San Juan serve as a focus cities and international gateways. American operates maintenance bases at Tulsa, Kansas City, and Fort Worth Alliance. American Eagle Airlines is an airline based in Fort Worth, Texas, USA. 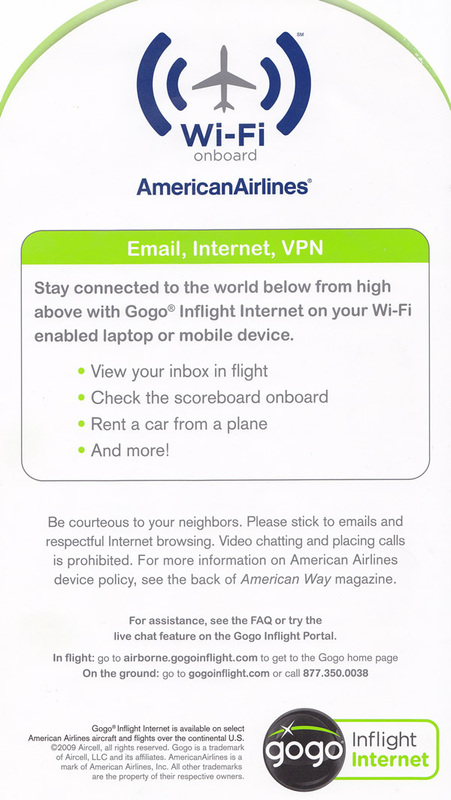 It is a regional airline partner of American Airlines (both are wholly owned by AMR Corporation). 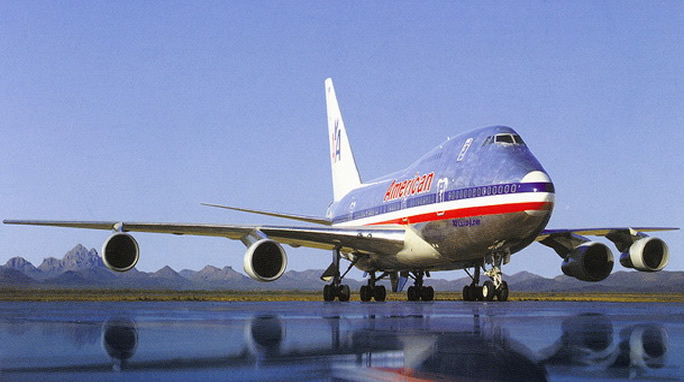 American is a founding member of the oneworld airline alliance. 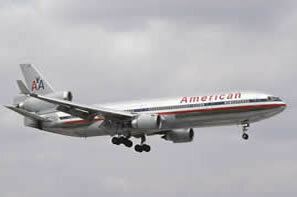 American operates a relatively young fleet, with an average age of 10.5 years . Almost half of its fleet is comprised of McDonnell Douglas MD-82 and MD-83 series twinjets, referred to by AA as "Super 80," denoting the type's original name, "DC-9 Super 80." Much of the Super 80 fleet dates back to the early 1980s, although they own some newer examples acquired from TWA. Regardless of age, most of AA's aircraft have been refitted with new interiors in the last few years, with the exception of many Boeing 757s. AA has also introduced new aircraft to its fleet: the newest are the Boeing 777-200ERs, which replaced MD-11s on key transoceanic routes in the late 1990s such as Tokyo Narita, and 737-800s, which replaced 727s and the BAC-111s on some domestic and Caribbean routes. American has discontinued three-class service on most aircraft, but continues to offer business class on 777 and 767-200 aircraft. First class passengers on 777 routes to London and Frankfurt enjoy the "American Flagship Suite," a first class seat that can swivel inwards toward a personal work area and also recline 90 degrees to become a bed. 767-200 flights between JFK, SFO, and LAX offer three-class "American Flagship Service" which replicates the passenger service offered on long international flights. On all American aircraft (except ex-TWA 757s), passengers in all cabins have a cigarette port DC power port at select seats. All classes of service on the 777-223ER have personal video screens, although they lack Audio/Video On Demand (AVOD) systems. These personal video screens offer GateConnect, a feature which allows passengers to view maps of the destination airports (gates, security checkpoints, baggage claims, etc) and find out information on connecting flights from that same airport such as gate, aircraft, etc. 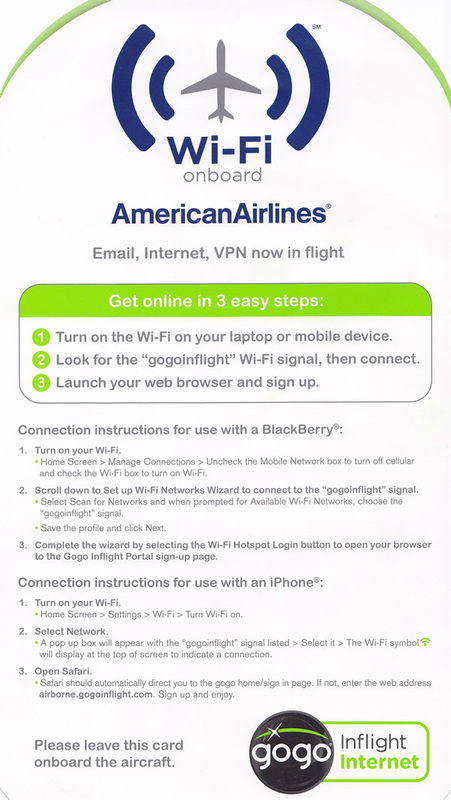 Most recently, American has taken the unique step of redesigning its schedules so that each hub city receives certain aircraft types more often than others, which is intended to simplify maintenance and last-minute fleet substitutions. Currently, Chicago, DFW and St. Louis get most Boeing MD-80(S80), 757-2Q8, and 757-231 service, Miami gets most 757-223 and 737 service, and JFK gets most A300 and 767-200 service. 777-223ER's and 767-323ER's are usually reserved for high density domestic markets and international flights. 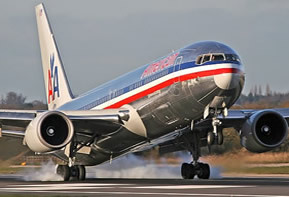 American Airlines was one of three carriers (Continental Airlines and Delta Air Lines being the other two) to sign an exclusivity agreement with Boeing in the late 1990s. When Boeing acquired McDonnell Douglas, the European Union forced Boeing to void the contracts. However, both parties have been adhering to and intend to adhere to the terms under a gentlemen's agreement. American Airlines, the world's largest airline, serves almost 250 cities around the globe, and it's working on the technology amenities. The company will test high-speed Internet access on some of its Boeing 767 jets. The service will be available for a fee to passengers in all classes and, pending successful tests, will be expanded to its entire fleet. American Airlines Video: Still primarily uses overhead screens. However, all Boeing 777 flights have in-seat video screens and ten channels of on-demand movies (TV programming coming soon). 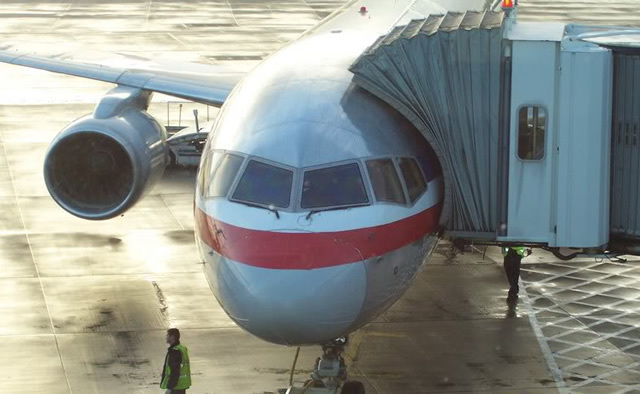 American Airlines Music: The same 14 scratchy stations we've been listening to for years. American Airlines Power: American Airlines aircraft have DC power ports, cigarette lighter-style outlets that deliver 15 volts of direct current. In coach, power plugs are available only in select rows on Boeing 737, 767, 777, MD80, Airbus 300, and most 757 aircraft. ARE YOU WONDERING WHERE YOUR AIRPLANE SEAT IS LOCATED ON YOUR NEXT AIRLINE FLIGHT? WHERE IS MY PLANE SEAT LOCATED ON A BOEING JET AIRPLANE? OR AN AIRCRAFT AIRBUS AIRLINER? WHERE IN FIRST CLASS? ECONOMY COACH? NEXT TO AN EMERGENCY EXIT ROW? LAVATORY BATHROOM? HOW MANY SEATS ARE ON THE AIRPLANE? DO I HAVE A WINDOW SEAT? IN THE MIDDLE? ROW SEAT?